Happy Fun Camp! : In Sri Lanka, monks beat you! I don't think I've ever heard of this happening before. 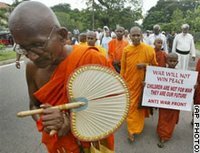 About six or seven monks from a right-wing Buddhist faction had stormed the stage during a peace rally attended by about 1,000 people in the capital, Colombo, shouting pro-war slogans, an AP reporter at the scene said. Right wing Buddhists? I didn't know they even existed. Aren't Buddhists supposed to be calm and at peace with the world? Not demanding that the government goes to war? I mean, I'm not even getting into the argument about which side is right or what, I just always thought Buddhists were automatically anti-war and violence, no matter what the situation. Like, if someone knocks down your tree, you don't go and kill them, you go and plant another tree, right? Or am I thinking of the Karate Kid? What was Mr. Miyagi? Oh jeez, this is all so confusing and vaguely racist. Buddhist Priests should not get involved in any politics. They should spend the time in begging for food and pray for PEACE. Is Buddhism a violent religion? It seems to be so. Wherever there is trouble, there one can find Buddhist priests leading the thugs. It is a shame!!!! Bloody fool can't you see Cristian Presets in this Image.